Dedication of Chris Burden, Light of Reason. September 10, 2014. Photo by Mike Lovett. 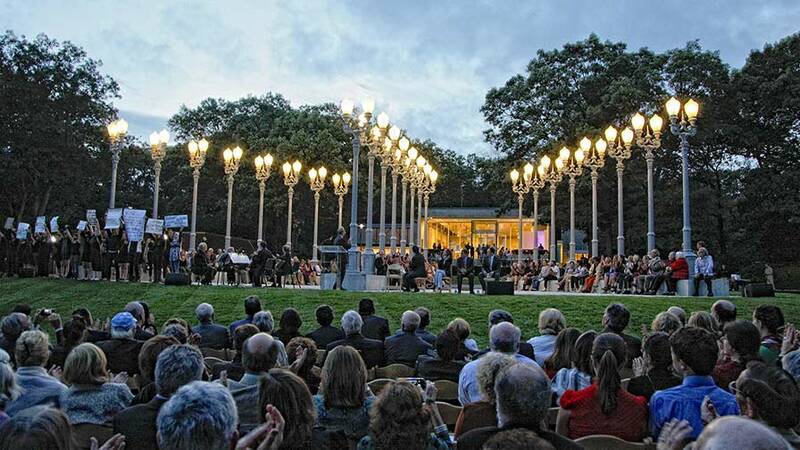 Chris Burden’s Light of Reason is a permanent sculpture commissioned specifically for the Rose Art Museum and Brandeis University. The structure of the sculpture was inspired by the three torches, three hills and three Hebrew letters in the Brandeis University seal, while the work’s title borrows from a well-known quote by the university’s namesake, Supreme Court Justice Louis Dembitz Brandeis: “If we would guide by the light of reason, we must let our minds be bold.” Antique Victorian lampposts and concrete benches form three branches that fan out from the museum’s entrance. Planned as an integral part of the image of the Rose and the university, the sculpture will serve as an inviting gateway to the museum and a dynamic outdoor space for the Brandeis community. Light of Reason was made possible through a special museum endowment committed solely to the acquisition of works of art. More information on Burden's installation can be found on our Frequently Asked Questions page. If you would like to host a formal event or performance at Light of Reason, please fill out our event request form and someone will be in touch to discuss guidelines for use and event logistics.